The renovation of the old machine shed is nearing completion. I reroofed the good part of the building a few years back, tore down part of the building that was no good early this year and the last few days put on a new sidewall and remaining few roof pieces. The side after framing up. Up on the roof putting one of the last pieces of roofing up. 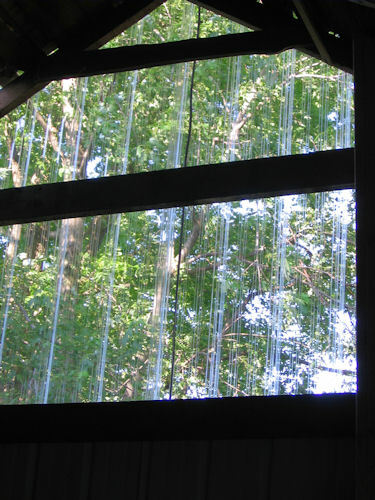 The view from inside – I love the clear panels that bring natural light into the shed without having to turn a light on. The building after new siding is applied. It’s not perfect, but it’s done! 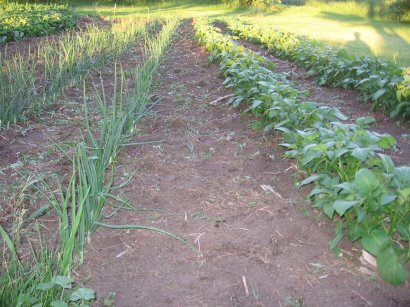 I’m on the Joel Salatin school of farming equipment – good enough and done is better than perfect and undone. 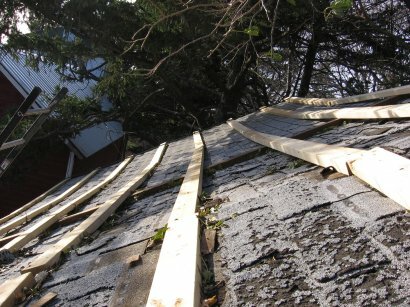 The roof rolls like the ocean, but the building will now stay dry in the rain. 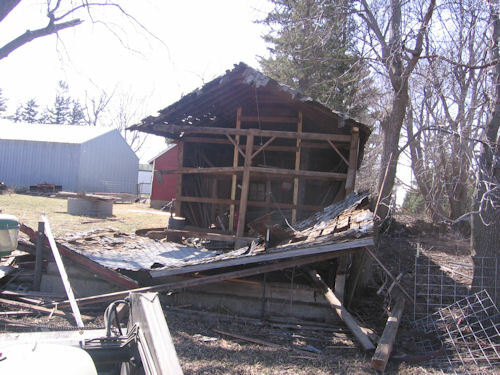 We continue to pick away at the shed deconstruction. All the asphalt shingles have been hauled to the dump and unfortunately, most of the lumber is too far gone to save. So it gets nails pulled as well as we can and hauled to the burn pile. After this piece is done, we can collapse the next section and then think about putting up the new end wall. 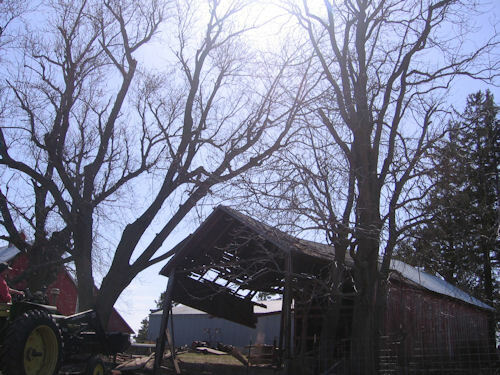 April 12, 2009 – Shed “Implosion” Part 1. I’m usually the last guy to tear down old buildings – I’ve received some serious guff for saving some pretty decrepit buildings, but this one was too far gone. 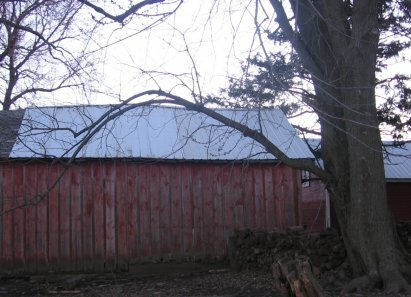 I’m saving the “good half” which has white roofing and tearing down the rest and can use the cement foundation for some other purpose, like a lean-to or the like. 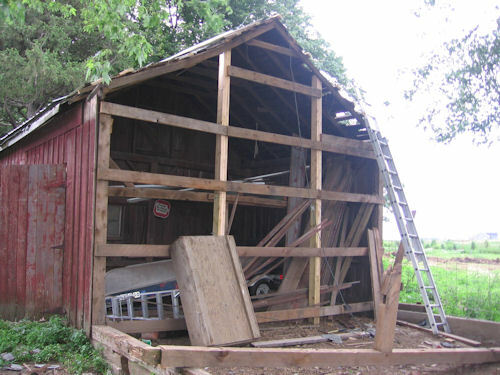 Here’s what the shed looked like after I ripped of all the board and batten siding from the part I planned on imploding first. I saved the boards, which would look nice in someone’s rec room. 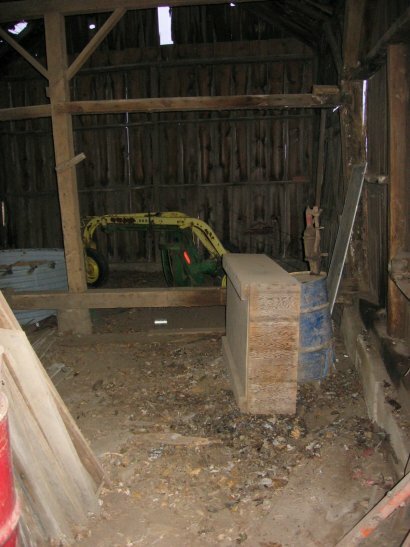 The first pull was to remove the center post, via a tractor and long chain. Martin was instructed to try to get a photo while the building was collapsing – here’s what he got as I was pulling out the corner post. In a quirk of good luck, the collapse went just as planned – no more, no less. 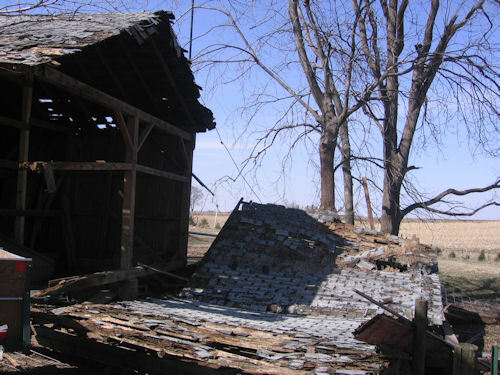 The collapsed roof. Now the fun part starts. I won’t burn the asphalt shingles, so will need to tear those off and send them to the landfill before deciding whether to disassemble or just burn the remaining wood. 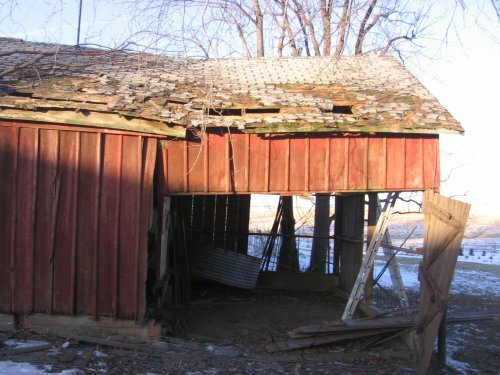 The east half of the old machine shed is beyond repair. Last year I put a new roof on the left side (just out of view of this picture) and new framing inside where the new end wall will begin. 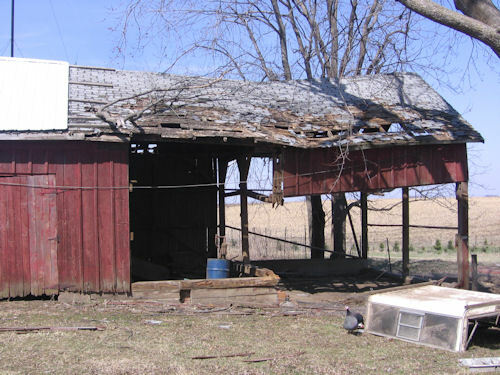 Here’s one view that shows the shed with some of the siding already removed and the sorry state. Here’s another view of the demolition so far. Depending on the weather, this project could drag out a while. We are saving the wide boards – they are wonderfully weathered and hope to find re-use down the road. 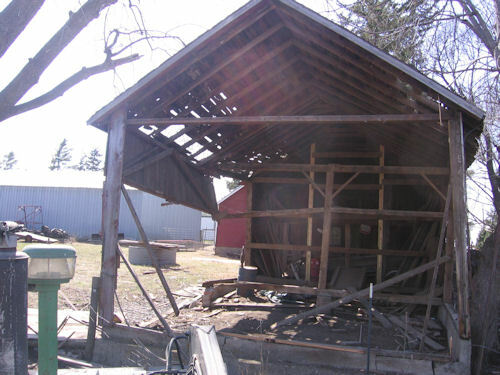 I hope to also salvage some of the 4×4 and roof rafters as well. 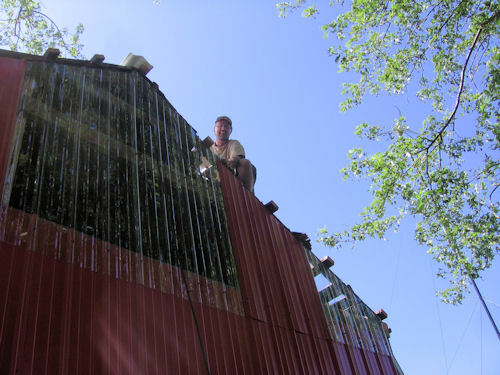 I hired out siding the 3rd story east and west dormers and while the guys were here, I had them frame up a new exterior wall for the old machine shed. Last year I reroofed about half the building, but the half that is over me in the photo is beyond repair – so the new exterior wall will go on this framing. 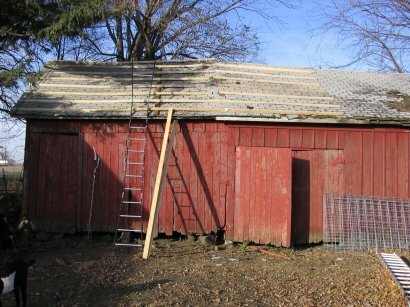 I’m debating saving part of the back wall and make a smaller open-ended shed for implements that will allow me to back into and detach implements and keep them out of the weather. 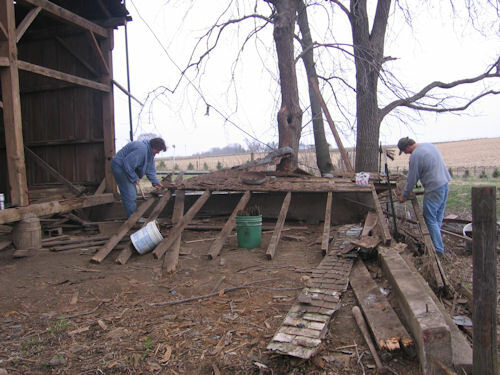 However, taking part of it apart, may be tricky, so it may be a total tear down and rebuild. I’m still mulling it over. I’m not sure why the original machine shed was built so tall. 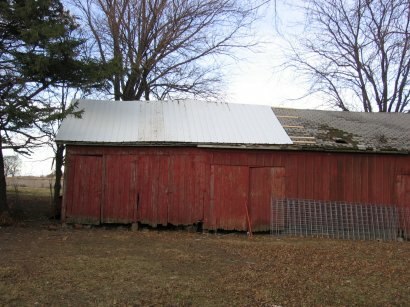 Today, after a year since the first piece was put up, the back roof of the machine shed it now roofed (or at least all I’m planning on roofing). 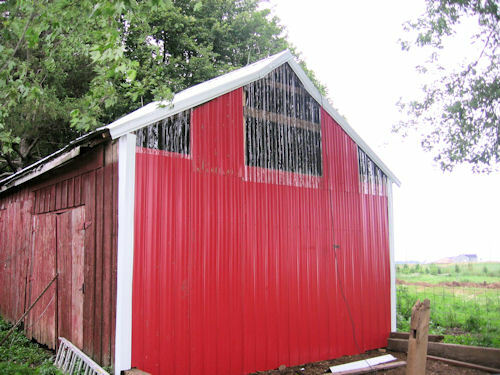 This brings a number of benefits – no more pile of steel roofing on the ground taunting me, no more drips in the shed, and no more having to straddle two sharp pieces of metal between the legs to put on a ridge cap. The plan is to tear off the rest of the building, or make it open to the south as the lower half is in pretty rough shape, even by my standards. Today I brought Thing 1 and Thing 2 (male dairy goats born last spring) to the locker. Six of the visiting does that were “serviced” by the buck (stinky jim) at our place had an ultrasound today and 5 of 6 have at least twins. So the open doe is back for another visit. 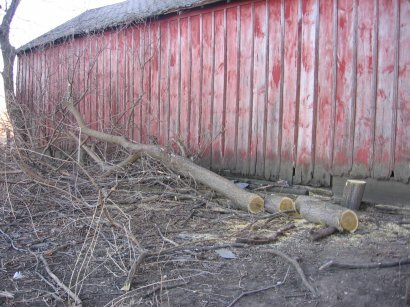 We also got a mulberry tree cut down that was on the back of the machine shed – one of those winter extras – so that when spring and roofing season starts, it won’t be in the way. 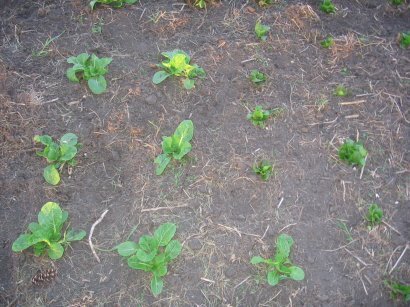 There’s still a lot of hauling and cutting to do, but it is at least down. In a family note, tonight was the last forced eye-drop administration of pink-eye solution to Martin’s eyes. It took one parent to hold his body and arms, another to pry the eyes open enough to get the drops in three times a day. He never did warm up to the procedure! We’re going on two weeks without sun. It came out for a peek this evening and for about 15 minutes a few days ago, other than that, it’s been two weeks since we’ve seen it. 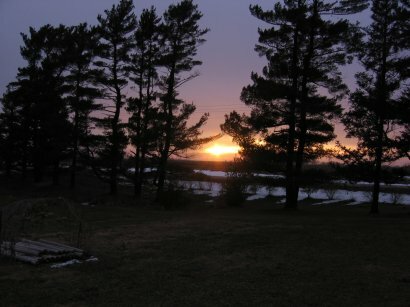 The good part is that it has been warm, most of the snow is melted; the bad part it the clouds get monotonous after a while. Today we finished cleaning up the attic and began to clean out one of the sheds that hasn’t seen attention since we moved in. This space was full of old lumber. 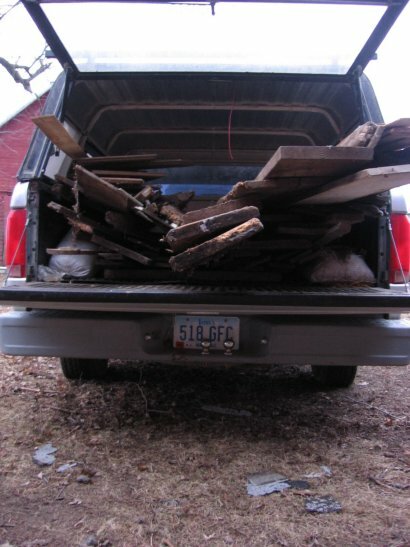 Here it is in the truck destined for the burn pile or storage racks in the corn crib. This is a little under half the haul. 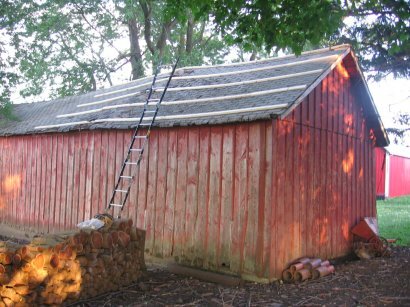 I’ve completed one side of the shed re-roof and I think I’m done unless the weather continues mild into early December. 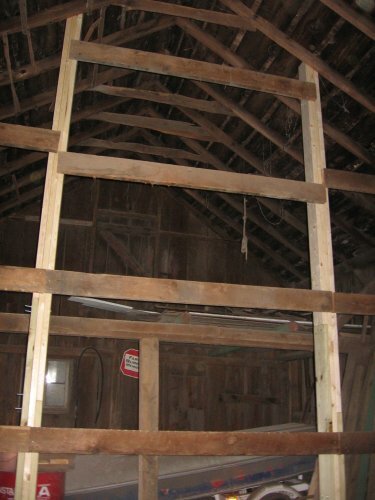 The first step was to pound 2×4’s horizontally on the roof into the rafters and through all the shingle layers. I had to put a few 2×4’s vertically to try to take some of the bigger swales out of the roof. These give me a footing on the rotting roof and give a solid surface to screw the metal roofing into. From up on the roof, you can see the boards. 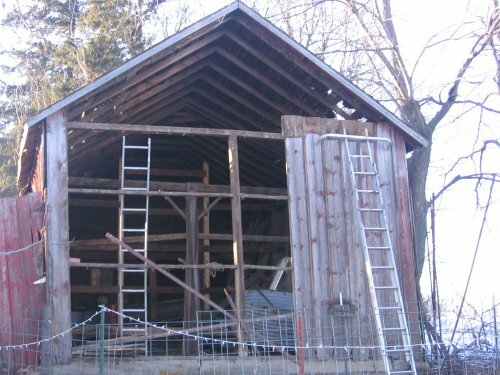 The plan for this building is to save the part that has a new roof and build a new structure in the footprint of the part to be torn off and put in doors in one of the new sections on both sides so animals can go through or be restricted to one side or the other. It will give us many more options than we have now.